← Volunteering for St Patty! Ok, LONG overdue for a work update, so here we are. As a quick “reminder,” about 1 YEAR AGO (!! ), I quit my corporate job and started working freelance. At first, I worked on random tasks and odd jobs exclusively through a site that I described elsewhere (a site that changed its business model and quickly became unusable, but don’t get me started on that one…). For the last year, I’ve been making random connections (all remote) and putting together a smorgasbord of work activities, all of which combine to bring an incredible amount of variety, stimulation, and satisfaction to my days. Every so often, I try to give a snapshot of my current projects. So, here goes. So, ANYWAY, here is my work update. By the way, the reason I like to note the “initial connection” for each is because I find it fascinating how sometimes the most interesting, rich, and productive opportunities can present themselves as a result of having originally been involved in the most mundane tasks… In fact, this is very often why I chose some of the initial tasks that I did – because for some reason, I saw an opportunity, a person, and/or an organization that sparked my interest and that I knew I’d like to be connected with in some way. And because I had (have) the complete freedom to choose whatever I want to do with my time and how much I want to charge for it (i.e., sometimes very little), I have often won the very opportunities that I had very consciously selected. As a result, I’ve been able to build new paths out of the little seeds of unique and varied opportunities that involved working with great people and interesting topics (and, by the way, to also cut off those paths that didn’t seem to resonate or to offer the positive rewards…another very important part of this formula). These experiences have provided lesson after lesson for me about the value of being open to new opportunities (in whatever form they arise), going with the flow, and trusting that good can come from the most surprising of places. Initial Connection: I updated the LinkedIn profile of one of the company’s Principals. This entry was posted in Work and tagged compassion, consultant, digital nomad, editing, freelance, income, independence, lifestyle design, research, travel, work, writing. Bookmark the permalink. not at all! as long as you know how to use a computer, you can do what i do. where are you these days? your pics are beautiful! do you ever work while traveling? yes, interesting to watch how life can get out of balance, the more you try to add to it. i find myself off kilter at times, for sure. but important to get it back before it gets too out of hand. like today – the sun is shining…gotta get back out into that beauty that calms and provides the grounding for all of this. thanks for your comment! i am digging your work a lot! So glad you’re happy in your work…what a gift. 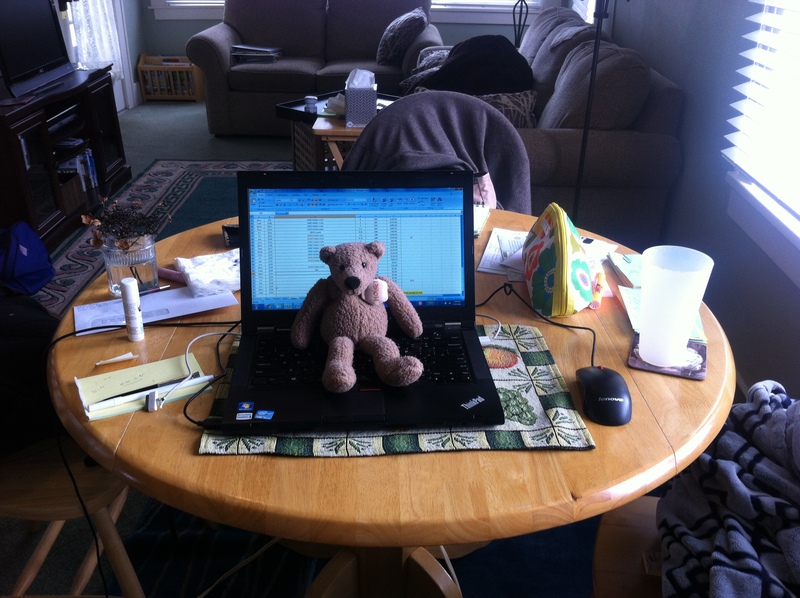 I LOVE your bear sitting on your laptop! I might have thought you’d be more of a stuffed bunny kind of gal, but teddies are always good. Stanley is a good bear name. 🙂 I always travel with my teddy, too.